Gender-based violence ends when we as a community stand together and say no. That was the message from RCMP Cst. 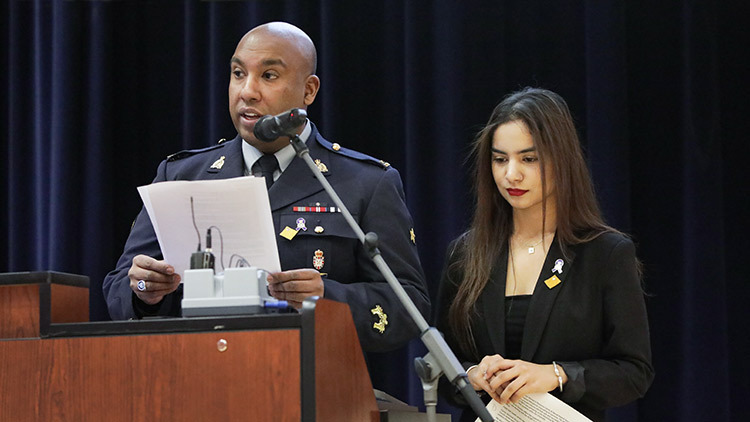 Deepak Prasad, one of the co-hosts of the National Day of Remembrance and Action on Violence Against Women commemoration ceremony that was held at StFX in the Schwartz Auditorium on Dec. 6, 2018. We as a community need to work on the issue, echoed ceremony co-host Iffat Sohi, equity student representative, StFX Students’ Union. “Although this incident happened 29 years ago, gender-based violence remains a reality,” Ms. Sohi said. Keynote speaker Dolly Mosher, Domestic Violence Case Coordinator, Halifax Regional Police Victim Services Unit, provided a Nova Scotia perspective on violence against women. She spoke about Silent Witness Nova Scotia, a program established in 2014 to provide education in the community around domestic violence as well as education around how to get help. Ms. Mosher provided sobering statistics on gender-based violence in Nova Scotia since 1990, including the fact that up until September 2018 there have been 62 confirmed intimate partner homicides in the province. “Anyone can experience domestic violence,” she said, noting it impacts all ages, all occupations and all geographic areas. Cst. Prasad and Ms. Sohi listed resources for help and options that are available in the community. Second year English honours student Emma Kuzmyk received a standing ovation after she performed an original poem during the ceremony. 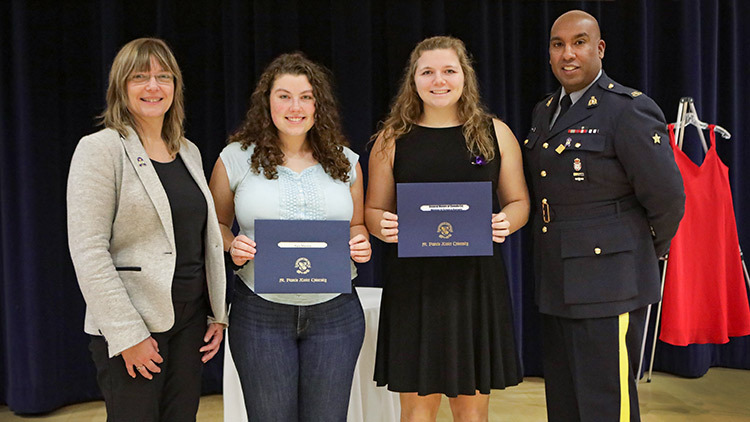 Also during the ceremony, StFX engineering students Sara Murrin and Claudia Fulton were recognized as the recipients respectively of the StFX Memorial Scholarship for Women in Engineering and the General Motors of Canada Ltd. Women in Science Bursary, awarded for leadership potential and academic standard.